I love quilting and crafting books, can't get enough of them. Over the past few weeks, I have thoroughly enjoyed reading through Lucie Summers' Quilt Improv book. The photography throughout the book is positively stunning, the quilts are gorgeous, and the step-by-step instruction is really in-depth, but also really inspiring, as you can see lots of different ways to vary the different blocks and techniques Lucie shows in the book. Another thing I adore about this book is seeing Lucie's drawings peppered throughout the book. If you're not familiar with Lucie as a fabric designer, having released two lines with Moda over the last few years full of whimsical low-volume line drawings, here's one thing you simply must know about her: she is an immensely talented artist, who sells her many of crafty goods on Etsy. 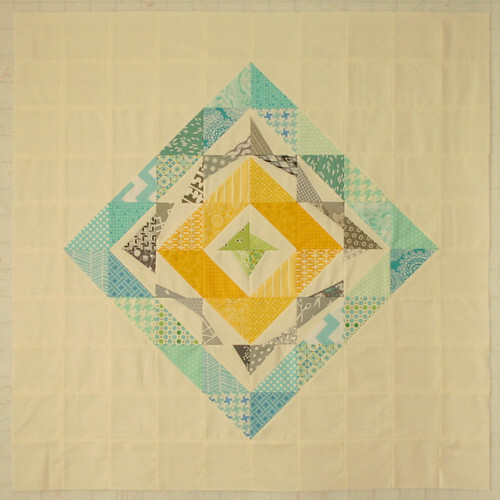 She's got a fantastic sense of color and style, which comes across in her quilts beautifully. She also blogs regularly right here. As soon as I paged through the book a couple of times, I knew exactly what I wanted to make from her book. Improv is often a challenge for me - it's hard to set aside my Type A tendencies sometimes - but I kept coming back to the Crazy Triangles technique. 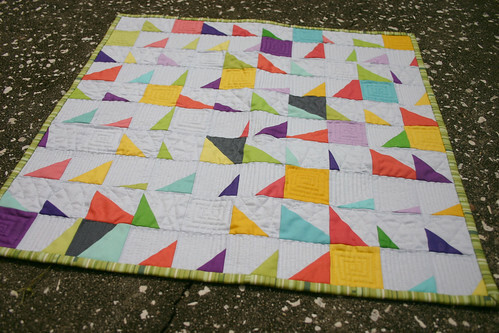 I especially loved how scrappy and vibrant Lucie's sample was, so I dug into my scraps to made a version of this super fun block. I managed to find a boatload of DS Florence scraps and some teal triangles in my unsorted scrap bin, and I liked the way they looked together, so I went for it. I can definitely see myself adding to this to make it a bit larger and turn it into a pillow cover at some point for the living room. It's already 15", so it's almost big enough to be a pillow cover, and it was really easy to put together. I love how great improv can be with scraps, how varied and interesting it can look when you just throw caution to the wind and start sewing bits and pieces together. 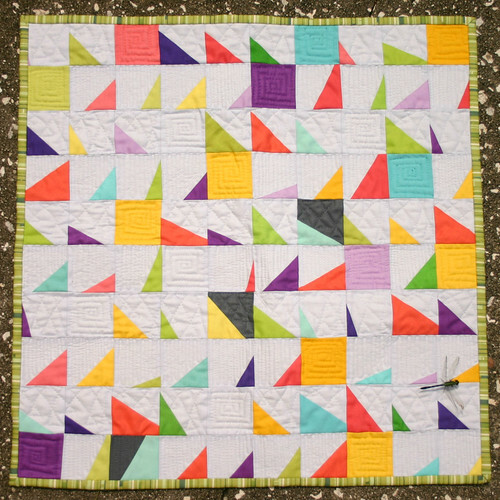 For links to past stops on the blog tour for Quilt Improv and loads of other fun bits of improv related inspiration, click here. The wonderful folks at Stitch Craft & Create were kind enough to offer up a book for me to give away as well, so to enter the giveaway simply enter the Rafflecopter giveaway below. A winner will be announced Friday morning. Have a great day today! Thank you all so much for all of your well wishes on my book news. I'm still pinching myself over the whole thing! I'm so touched by the things you guys have said to me, I really appreciate all the support. As soon as it's listed for pre-order, I will be sure to let you guys all know! 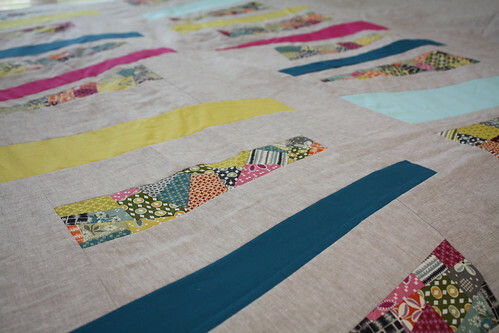 In the meantime, I've got some good news to share on my Hope Valley improv quilt today: I finished the quilt top. Yay! It's officially big enough to fit on my queen-sized bed, and because of that, it's nearly impossible to photograph. But, I love it so far. 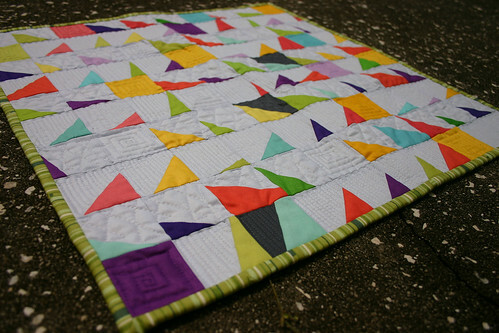 :) You can read a little more about my work on this quilt right here. The bad news? Now I have to baste the darned thing! Yikes. My weekend clearly is going to include a heck of a lot of quality time with my 505. And I need to shop for some Aurifil thread to match the yarn-dyed Essex to quilt it with - thankfully my MQG meeting is tomorrow at Inspire Quilting & Sewing, where they stock boatloads of Aurifil! Hope you have a great weekend! It was a pretty busy weekend in my neck of the woods, but I did manage to find a bit of time to do some sewing. I'm really starting to make some progress on my Hope Valley improv quilt, it's actually starting to look like something, which is exciting. Especially after the initial dread I felt after chopping it up into pieces. 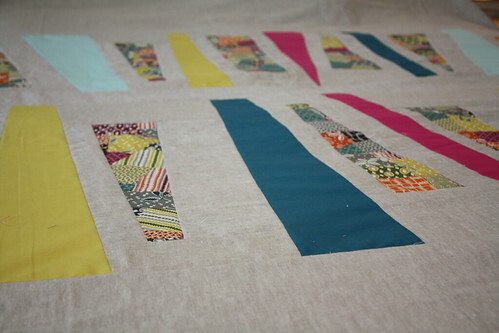 Do you have a fabric collection that you can't bear to cut into? Hope Valley is one of those lines for me, I've been hoarding it, just waiting for the perfect project for it, until I decided that I just wanted to use it. I wanted something made out of it that I can enjoy, rather than walking by where it sits on my fabric shelves and eyeing it longingly. So I chopped it up. Eek! I'm using a pattern in Quilting Modern by Jacquie Gering and Katie Pedersen, one of my favorite quilting books. This pattern is found in the modern crazy piecing section, which is the section of the book where I want to make every single quilt! This one is called Winter Windows, and is done up in beautiful muted blues and grays in the book, so I'm hoping that my bright color scheme won't totally ruin this quilt. I'm happy with how it's working out so far. I've gotten to the point now where I'm starting to assembly the crazy pieced strips with background fabric and then with the accent solids. 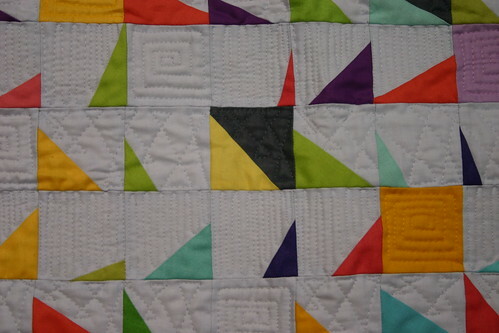 I'm loving these solids together - I think I might just have to do another project with this color scheme at some point! My background fabric is Essex Yarn Dyed Linen in Flax. I had initially intended to do a mix of fabrics for the background, subbing in some Essex Linen in Natural and maybe another light colored chambray, but I didn't like how they looked together ultimately. The colors are quite similar, but the other linens just don't sparkle the way the yarn-dyed one does, so I'm sticking with it. I've been working off-and-on this week on a project from Jacquie Gering and Katie Pederson's seriously awesome book, Quilting Modern . Improvisational piecing is just so much fun to do, and Jacquie and Katie do a wonderful job teaching various improv techniques that you can put to use in lots of different projects, not just those in the book. I'm working on the Swirling Medallion quilt found on page 113 of the book, using some green, gold, gray, and aqua prints, This quilt uses the improvisational stitch and flip technique, which can be super duper versatile. You can use it to make wonky stars, wonky zig-zags, just about anything you could make with a half-square triangle unit. 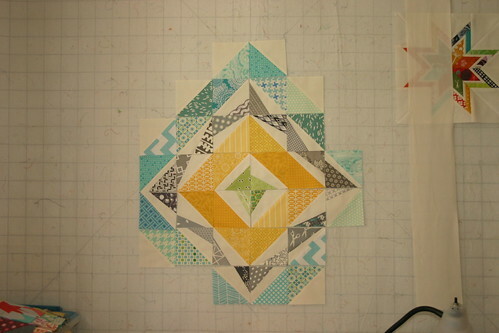 I think a wonky zig-zag quilt might just be in my future, using this method of piecing. 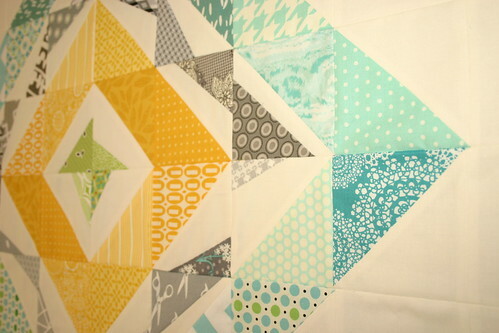 I just finished up the quilt top, but haven't decided on backing or quilting just yet. I am totally in love with this quilt and am half-heartedly trying to find a place in my house I could hang it, I love it so much. Fortunately, I suspect I'm going to be indecisive for a little while about this one, so it can hang out on my design wall for the timebeing, making me smile whenever I look up at it. Next up? While I'm thinking about how to quilt this one, I think I might just attempt to make a dent in my string scraps and work on a string project!